NPR asks: Does Diabetes Need A Blue Button To Establish Its Disease Cred? Yes NPR, we do need blue….. Breast cancer has a pink ribbon. Cystic fibrosis has a purple ribbon. Heart disease has a red ribbon. Would diabetes be easier for people to talk about if it had a blue circle? Some advocates think so and have been pushing various diabetes groups to unite behind the color blue. The idea has a lot of traction outside the United States. Hundreds of edifices around the world, from Nelson Mandela Bridge in Johannesburg, South Africa to the Museum of Islamic Art in Doha, Qatar, were illuminated with blue lights on Nov. 14, World Diabetes Day. But in the United States, diabetes groups are all over the color spectrum. The American Diabetes Association uses red; the American Association of Diabetes Educators favors orange and gray; while the Juvenile Diabetes Research Foundation goes with blue. Since more than one-third of Americans are either diabetic or pre-diabetic, you’d think here’s one disease that doesn’t a color to establish cred. 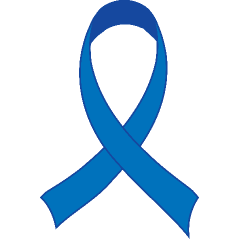 Then there’s the fact that Americans may be suffering from awareness ribbon fatigue, seeing as there are nowhundreds of variants, for diseases from Lyme disease (green, of course) to interstitial cystitis (teal)….. This entry was tagged breast cancer, Chronic Illness, diabetes, diabetes advocacy, fundraising, NPR, type 1 diabetes. Bookmark the permalink.